The Bahama Mama is a fast and modern ship, capable of carrying 1000 passengers and up to 126 vehicles on each of its crossings. 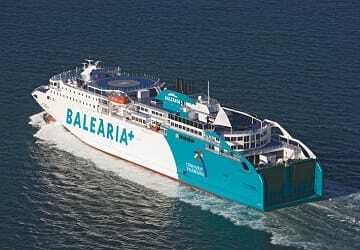 This Balearia Caribbean service reaches speeds of 23 knots whilst delivering travellers with smooth sailings. You’ll find plenty to do on board, with numerous bars, cafes and restaurants, a wide array of accommodation options, different lounges, as well as a swimming pool, games section, massage treatments and large outdoor deck area, ideal for helping the time fly by. 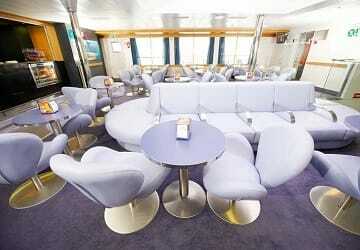 The ship is catered for passengers with reduced mobility and has a huge range of facilities for younger voyagers. You will be spoilt for choice on the Bahama Mama for both seating and accommodation options. 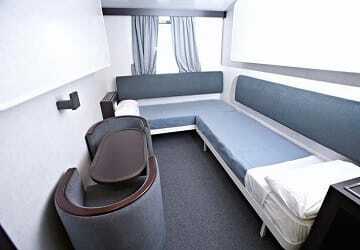 The vessel is equipped with 48 cabins, including a small number of VIP rooms. All rooms contain air conditioning, wardrobes, fully fitted bathrooms and anti-allergy cleaning system. 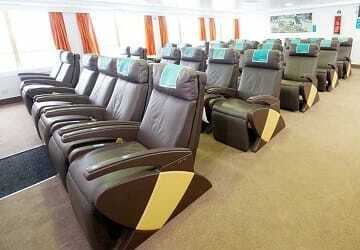 You don’t have to book a room as there is ample comfortable seating across the ship. The Lounge and Superior seating provides travellers with a great place to sit with large television screens in view. 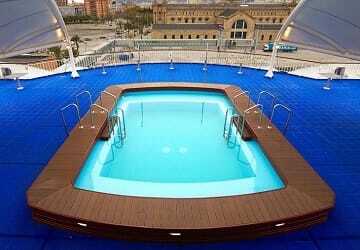 If you fancy some fresh air and a top up of your tan additional places can also be found out on deck. Alternatively, there is room to relax around the Lobby Bar section, where you’ll find a large amount of tables and chairs. 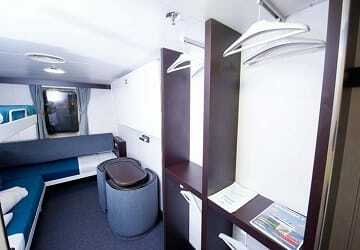 Luggage lockers are available for passengers without a room. The Bahama Mama is far from lacking in culinary options. 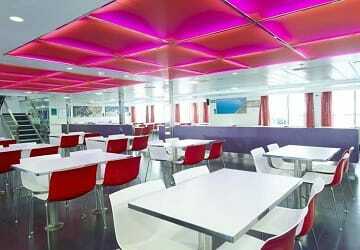 Aboard you will find a wide range of food and drinks to suit the most diverse of tastes. Whether you want a snack on the go or a sit down three course meal, you are covered. The a la carte restaurant provides diners with a sophisticated setting to enjoy delicious food and a sumptuous selection of wine and drinks. 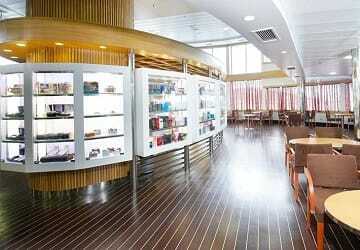 For a more informal setting, but still a fantastic array of dishes, the self-service section is the ideal destination. There is also the bar and cafeteria area to grab a quick snack or the outdoor bar for sip on something in the sun. Whether you need to pick up some holiday essentials or are searching for the perfect souvenir, the on board shop will provide you with what you need. Magazines, books, confectionery are on sale, as well as gifts, souvenirs and postcards to send back to those who aren’t able to join your travels. Boredom won’t be an issue whilst making your crossing, as there are plenty of amenities and services to keep you occupied. The swimming pool situated on the upper deck allows you to take in the views, the beautiful weather and chill with a refreshing drink on the poolside, whilst still on the move. There is no problem if you want to travel with your furry friends as there are spacious pet bays on board. Here your four legged companions will be safely housed and cared for throughout the journey. Don’t worry about being cut off from the outside world, as mobile phone charging stations and internet access is available to the public whilst you cross the ocean. A games area with slot machines could provide you with some excitement and a chance to have a little flutter. A number of board games are available, so the whole family have the chance to while away the hours together. If the sumptuous suites, comfortable seating and the swimming pool haven’t quite got you to the relaxed state you desire, you can enjoy a session with the ship’s masseuse. Children are well catered for on this Balearia service, with an array of amenities to suit the younger traveller. For the smallest sailors, cots and high chairs are offered and changing facilities can be found scattered around the ship. The restaurants have a specifically catered children’s menu so the little ones don’t have to miss out on the on fantastic food on offer. With a designated kids’ area, club, entertainers and even colouring books available, passengers of all ages are sure to enjoy their time sailing with Balearia Caribbean. 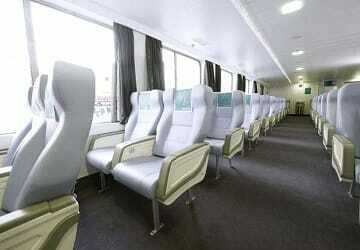 The ship is adapted throughout and caters for passengers with restricted mobility. With specially designed lounge chairs, bathroom facilities and cabin accommodation, travellers with specific requirements are provided with a comfortable passage. There are lifts between all hold and passenger decks as well as safety anchorage points for wheelchairs. Please Note: Whilst we have taken great care in making our Bahama Mama guide as accurate as possible, onboard facilities, services and entertainment may vary depending on the date and time of year that you travel, facilities mentioned may change without notification and ferry companies reserve the right to operate vessels other than those mentioned at time of booking without prior notification.